This Rat Sailed: Heading South. I don’t remember if I mentioned this yet, but we simply ran out of time to make it to the Bahamas this season. Our backup plan is to at least spend a little time in the Florida Keys before we have to make our way back north for H season. 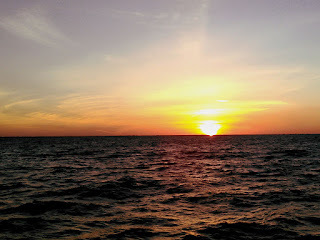 On 4/7 we finally left Hammock Beach Marina heading south. There was a small weather window that would allow us to make an outside run to Ft. Pierce before the small craft advisories start back up. It didn’t sound like ideal conditions, but workable. There was to be a weak cold front passing through the area on Thursday morning and the prediction was for a fast shift in the winds, which had been blowing hard from the east for the past few days. The quick shift in the wind would likely not abate the swell that had been building the past few days but should stretch the period of the 3 to 5 foot waves out from 5 seconds to around 10. That would make the ride a bit more comfortable. And a 20 knot beam wind would give us a chance to actually sail. We motored down the ICW from Hammock, past Daytona, and to the Ponce Inlet where we could access the ocean once again. It has been a while since we've been to this inlet, and things seem to have changed. We did an initial sea trial in this expanse of water and now we find a pretty narrow and shallow channel with lots of shoaling. I should have taken a picture or two, but our attention was on safely maneuvering Rover out. Once on the outside, we found wave conditions pretty much as expected. The swell was about 3 feet on a 10 second period from the east. The winds were a bit higher, blowing 30+ knots from the west and this added little west moving choppy waves to the mix. It wasn't uncomfortable, so we put out the reefed genoa and were sailing along at a comfortable 5 to 6 knots. 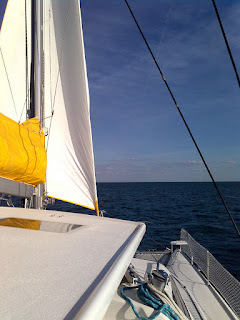 After the long motor down from Charleston to Hammock, it was nice to finally be sailing again. 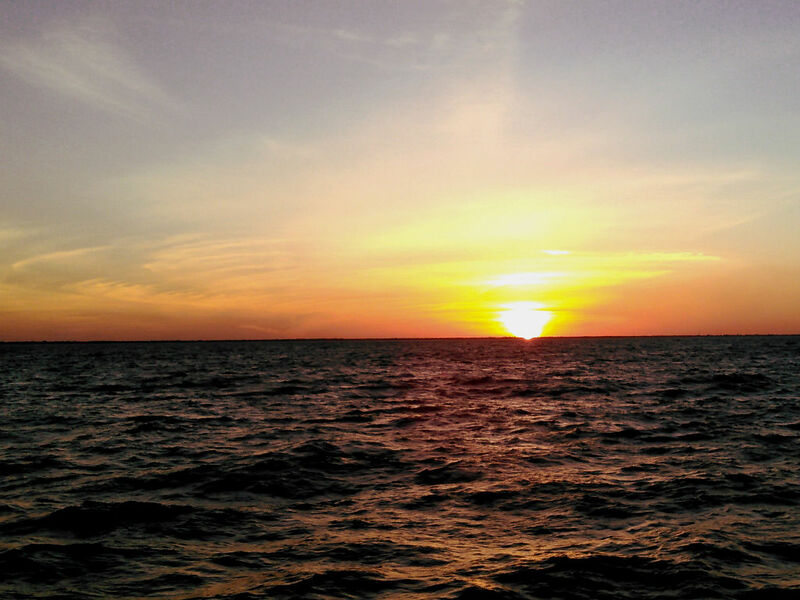 Overnight sailing is always interesting. It started out pleasant, and I even spent a little time laying out on deck looking at the stars on this moonless night. The sea became a little unsettled as we rounded Cape Canaveral while the lighthouse and big vehicle assembly building looked on. Sorry, no pictures of that either, as you can't really take a good picture at night from while constantly bouncing around the platform...and I did try. Just south of the cape is Port Canaveral. It is funny how all the big ships are always moving about at night. Even this small port is no exception. We encountered 3 cruise ships lined up on approach as we crossed the channel entrance. 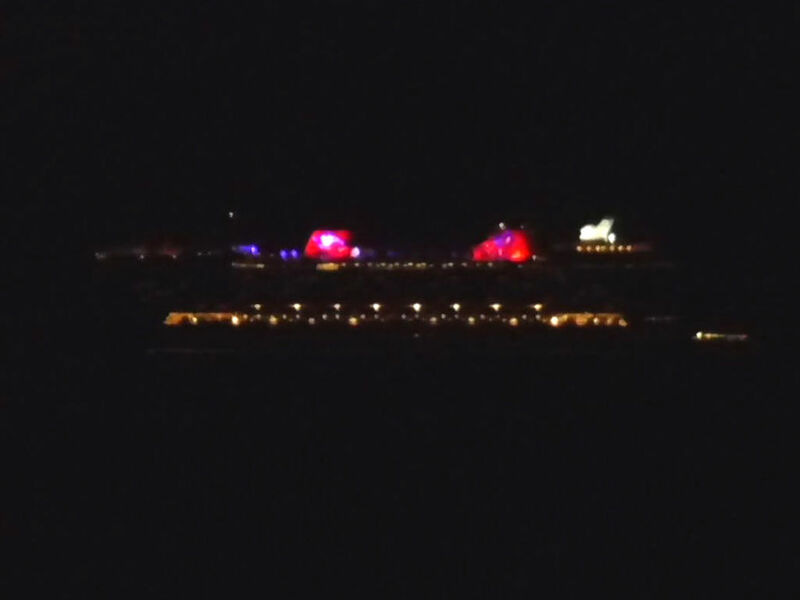 One of them, a Disney cruise ship, came within about a mile and a half of us. Even at that distance, it is amazing how big they are. And they are always lit up like a small city. They never show you this when you are learning about night navigation. Good luck seeing a little red, green, or white navigation light when it looks like part of the Manhattan skyline is floating around out there. I usually monitor the floating masses of light with my radar to figure out where they are heading...and to let them know I'm there. 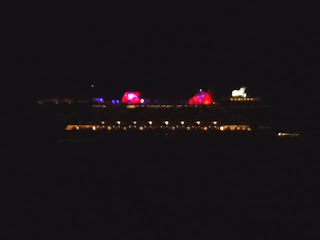 of a cruise ship at night. of course, the boat is only 1.5 miles away. A video screen capture of the same boat...for reference. Morning came while I was taking a nap. With the morning came lower winds. Still we were able to sail all but the last 10 miles of the outside leg of the trip. Unfortunately the wind did die to ZERO just before we arrived at the Ft. Pierce inlet so we fired up the motors a bit earlier than I would have liked. But it was a far cry from that previous all motoring trip. We started to make our way in, and the current coming out of this inlet was strong. We were an hour from low tide and with engines set where I would usually be making 7 knots, we were doing right around 2. Not good. We decided to turn around and wait the hour for low tide to see if that would help. Ironically, the wind picked back up a little while we were trying to enter the inlet, so we were able to heave-to and wait by pulling out a little of the genoa. Unfortunately waiting didn't help all that much. Probably not even half a knot. Oh well, guess we will push our way through. It was a slow trip up the inlet. Only the planing hull fishing boats had a better time of it. Things did improve as we got to the ICW at the end of this inlet, but there were sill some decent currents. This lasted all the way to our parking spot at the marina. The marina is where it got a bit exciting. We were making our way through the narrow channel that ran across the current. A squealing noise started emanating from the port engine. Along with the squeal was a loss in power. I was trying to contact the marina and let them know we were having engine problems and needed the location of a T-head we could stop at. Of course we were having a hard time contacting the marina and impressing on them what we needed. 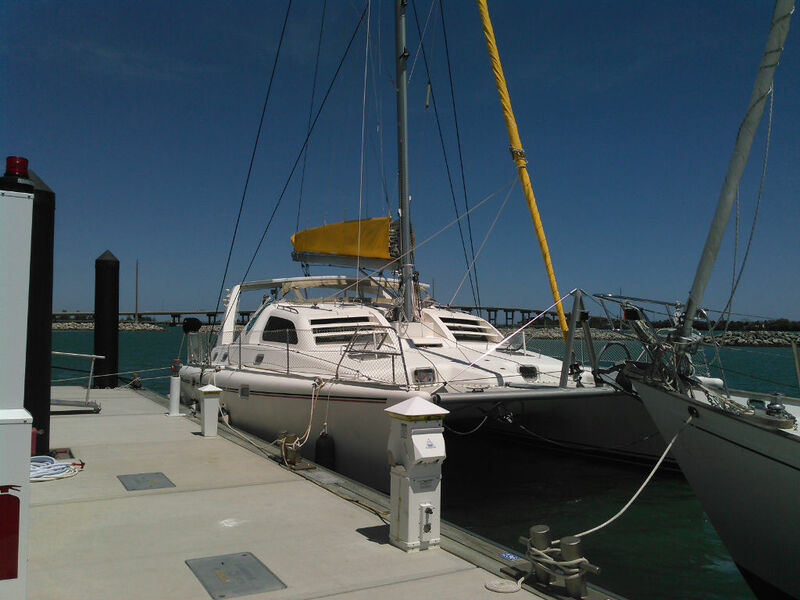 A catamaran with two running engines is easy to maneuver, even in tight spaces. When one engine fails, it is a whole other game. When the boat has enough speed, the rudders can counteract the asymetric thrust caused by power applied only at the one corner. At speeds needed to maneuver in a tight marina, not so much. It is like driving a car with no brakes that can only turn to the left. Add in an impatient fishing boat that decided it was a good idea to pass by a struggling catamaran in a narrow channel, and that was just the cherry on top of our little disaster cake. A series of well orchestrated left turns and I was able to get enough room to get a little speed up and get the boat moving straight toward a spot on a T head. The employee at the marina arrived just in time to hep with the lines and get us settled in. By this time your dear captain was not in the best of moods. Letting things settle down first, I finally went down to the engine room to see what the issue was. Having just changed the transmission oil, my imagination jumped directly to something catastrophic with the transmission. I know I replaced the oil...did I not get enough in the transmission? Am I going to be stranded in Ft. Pierce for months waiting on a transmission? The first thing I did was grab the coupler that holds the propeller shaft to the engine and try giving it a turn. In neutral, I should be able to spin it by hand fairly easily (it free spins when under sail). Imagine my surprise when I spin the coupler and it spins very easily...but the prop shaft doesn't move. I grab the shaft and it spins fine...and slides. I slide it a little bit, making sure I don't push it far enough it will go out of the boat and I could see where the coupler had let go of the prop shaft, and the squeal I heard was the metal of the coupler spinning against the shaft. I grabbed a socket wrench and box wrench, slid the shaft back up into the coupler, and tightened the four bolts of the coupler. We fired up the engine and give it a test, and all seems well again. So, we are in Ft. Pierce to meet a friend of my wife's and then should be moving south in a couple days. Our intention is to spend much more time at anchor going south, so blog updates may be spotty depending on internet access options. Hopefully we'll have good times and less drama to write about when we are able. Glad you are on the move again! I hope you can enjoy the sunshine and cruising instead of all these boat issues. We hope so to! Thanks for the tip on Elliot Key, we will have to check it out. Always looking for tips on where to go. Thanks guys! If you do get down to KeyWest and have some time, I'd highly recommend going just a bit further to the dry tortugas. We skipped it this spring and have regretted it ever since. So many people have said such good things about it. Been there on the ferry. Would like to go back, but not this year. You are quite welcome Steve. Glad you enjoy my ramblings. Any idea why the bolts came loose? Seems you or mechanic would have made sure they were tight when you made shaft support repair awhile back. Would Loctite help? Nothing like loosing a prop and shaft in the deep blue sea, plus having the resulting 1" hole in the boat. Think airplane bolts without safety wire. Hey Doug, sorry for the late reply...internet issues and boat issues. Not sure why they came loose other than the guy I hired a while ago to "look over everything" didn't really look over much. Yeah, kinda the equivalent to an airplanes prop bolts. Safety wire would be a good idea, but I think I just need to make sure to check the torque from time to time.